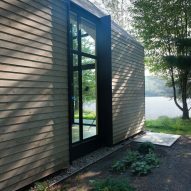 Canadian firm YH2 has completed a contemporary cabin beside a lake in Quebec, with pale cedar cladding running up the exterior walls and over its gabled roof. 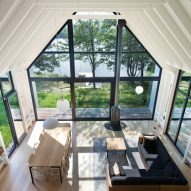 The home is aptly titled Window on the Lake after a glazed wall that fills the gabled end of a double-height living room. This great room looks out onto the body of water and wooden steps leading down to a dock on the shore. The roof extends beyond the glazing to form a small porch over a seating area. The residence measures 1,507 square feet (140 square metres) across two storeys, and is designed to comfortably accommodate eight people. 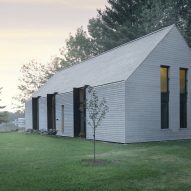 Based in Montreal, YH2 built the house on the site of an old family cottage, in a small clearing with woods on either side. 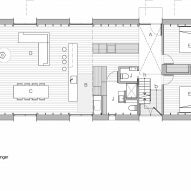 Its layout comprises an open-plan living room and kitchen on its ground floor, with a large light wood dining table anchoring the sunlit space. 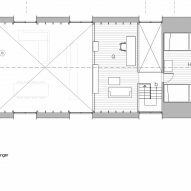 Two bathrooms and two bedrooms are also located on the lower level, while a room with four double-sized beds arranged on either side of the walls is found upstairs. 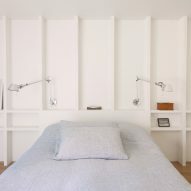 To save room on storage space, drawers slide up underneath the four bedframes. A lofted office and sitting area overlook the great room below, with glass half-walls creating a transparent barrier. The building's balloon frame is exposed across the walls and ceiling. 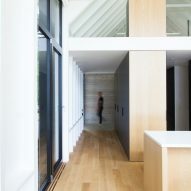 "Its exposed wooden studs and joists painted white give the building a unique rhythm of shadow and light," said YH2. Horizontal cedar boards wrap the exterior of the house, both on the walls and across the pitched roof, emphasising the length of the design. Across both long facades are three tall windows, interspersed evenly with black metal ribbons, which complement the home's symmetry. The house is located midway between Montreal and Quebec City in the foothills of the Laurentian Mountains – a popular getaway for urbanites from both cities. 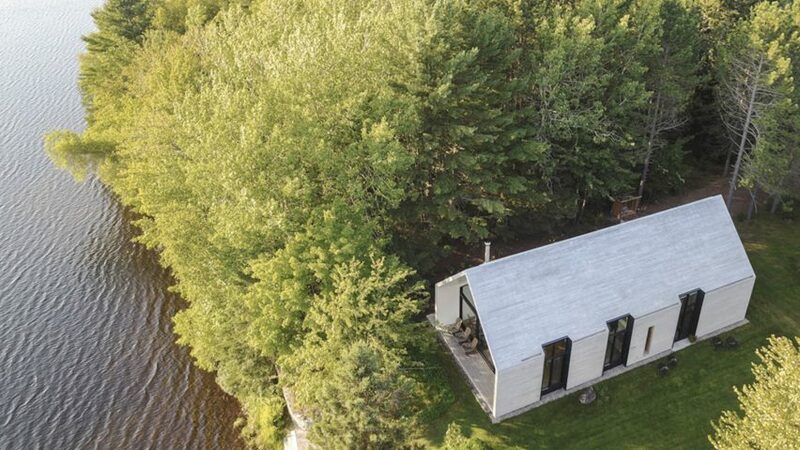 Other nearby retreats include a black A-frame cottage by Jean Verville and a two-storey cliffside residence with a large outdoor deck by Alain Carle. 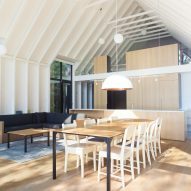 Among YH2 has completed several homes in Canada's Quebec province, such as a ski chalet with a V-shaped timber roof modelled on bird's wings, an angular cottage covered in dark shingled with a stark white nook upstairs, and a two-storey lakehouse with a concrete base on upper gabled design clad in lightwood.